Janhit Foundation has been promoting organic agriculture as a viable, sustainable alternative to conventional farming practices throughout the past decade. land becoming increasingly fertile. 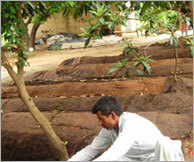 For the farmer, this increases the long-term yield, the nutrient value and potency of their crops. We work with small, marginalized farmers throughout the region with the aim of enhancing their income through a reduction in input costs and a switch to organic farming. With sugarcane being the primary crop grown in Western Uttar Pradesh, we have undertaken considerable work with sugarcane farmers, encouraging them to minimize the use of toxic Persistent Organic Pollutants (POPs) and providing them with innovative technologies and agricultural techniques to improve their crop and enhance their yield.